This week, I should be focusing on the books to the left of the Star Wars: Ahsoka novel. What will I probably be reading? Those on the right of it (and including it!). The books on the left are books I have bookcrossed and are going to be boxed up for the Akron Reading Festival that the Rubber City Book Posse attends each year. They collect and distribute THOUSANDS of free books–all so that they can help turn the world into a library. How cool is that? 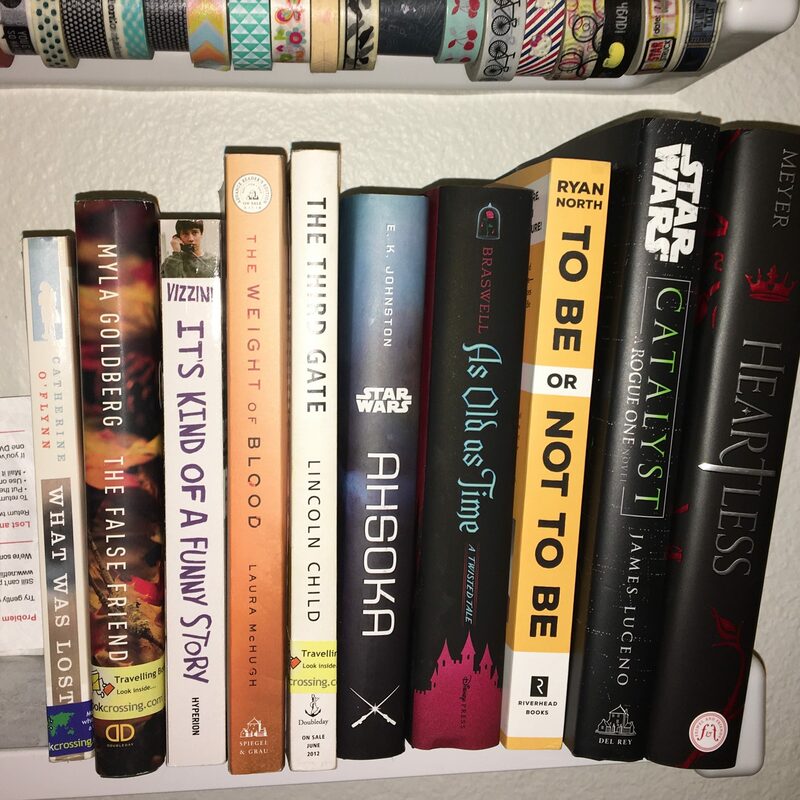 By sending them books, I am helping get my own Mt TBR (and in turn shelves) into order–yay!!!!! Please note, below are some items you can buy. I get a small commission to help pay the hosting bill if you click my link, but it is no additional cost to you. In addition to Amazon’s massive sale, Early Bird books has a list of awesome books on sale. I ended up getting the Color Purple box set digitally. The good news is that this sale goes on for the rest of the month. I’m just under 160 books read for the year (157) and I’m 45,000 words into my 50,000 word novel in a month. So I’m doing pretty awesome. Anyway–it’s Monday–what are YOU reading? I have six or seven books going most of the time. Now that I do a mix of books and ereading, I am never without something to read! I am reading Sherrilyn Kenyons Dark Hunter Series. Its amazing but has many many books. I wish I had some extra time to read now. I am so super swamped with work and holidays that I am on overload. But – great suggestions and I hope to be able to settle down with a good book soon! Bookcrossing sounds like a really good idea. Hope you enjoy Truly Madly Guilty when you get to it. I’m in the middle of Big Magic by Elizabeth Gilbert. It’s not as tantalizing as Eat Pray Love but I like the premise. Oh my gosh – I had to stay away from book sales over the weekend or I would end up with a massive haul! There were so many good sales happening!!! “It’s Kind of a Funny Story” is so good! I just got like 10 books today on Amazon haha. It’s Monday and I’m reading A song of ice and fire! This is the second time I read it, I love it!! Oh I’m coming back to see what you have for what you’re reading 😉 I LOVE reading it’s my favorite hobby and way to wind down! I am always reading a new book. Right now I am reading The Girl With The Dragon Tattoo. That sounds amazing. There’s nothing like reading a new novel. I think it’s great that you’re following up on the Star Wars novels! Wow! 160 books in a year that is an amazing goal and you already have 157. At the moment I am reading about Ancient Egypt. I needed a good book! Thank you!! Def going to try to read more! I am eagerly awaiting the arrival of a box from Amazon, containing a copy of “The Help”, by Kathryn Stockett. I’ve seen the movie several times, but somehow I’d never gotten around to reading the book. I can’t wait for the mail to come today! I so love reading! I’m currently reading The Boy Is Back by Meg Cabot. I was actually looking for a new book to read. All these books look amazing, thanks for the recommendations! You have made some great selections. I have started a couple books. I actually have been more diligent about finishing them here lately. I need to get back to reading. I miss it! As single mom of three its sooo hard! I have been incredibly busy lately, so I have not been reading anything. I did start Game of Thrones and I am on the second chapter and the book is just sitting there all sad I have not completed it yet. I don’t usually read books but my son does. And star wars is one of his favorite. I need new book recommendations, since my Kindle list is getting a bit small – and the books still on there don’t really interest me anymore. I really need to find more time to read so I can get through my reading list before that happens! I am always looking for new books to read!! Thanks for the recommendations, I have not heard of a couple of these before! Wow you’ve read a lot this year. I can never find time to stop and read and book. This sounds awesome. I don’t make the time to read books lately, but I definitely need to. I have a stack on my nightstand waiting for me. Wow can’t believe how many books you’ve read this year. I’m not reading anything at the moment, but I might need to add this to my list. What’s super funny…. I was looking for a book to read. Thanks for the recommendations! I love reading but havnt had the time just recently with blogging and Christmas etcc but defiantly looking to start doing it again come the new year!